This record marks the start of DNS zone and contains key information about how it is to be managed and used. The SOA record is the most complex of the DNS resource record types; its format can be found in Table 175 and also in Figure 251. Master Name: The domain name of the name server that is the source of the data for the zone; this is of course normally the primary authoritative server for the zone. It is encoded using the standard DNS name format. Responsible Name: The electronic mail address of the person responsible for this zone. E-mail addresses in DNS are encoded using a special variation of the regular DNS name notation. Serial Number: The serial number, or version number, of the resource record database for this zone. Used to determine when changes have been made to the database to trigger zone transfers. See the topic on zone transfers for information on how this field is used. Refresh Interval: The number of seconds that secondary name servers for this zone will wait between attempts to check for changes made to the zone database on the primary name server. See the topic on zone transfers for information on how this field is used. Retry Interval: The number of seconds a secondary name server waits before trying again to check with a primary for changes if its previous attempt failed. See the topic on zone transfers for details. Expire Interval: The number of seconds that can elapse between successful contacts with the primary name server before a secondary name server must consider the information it holds stale. 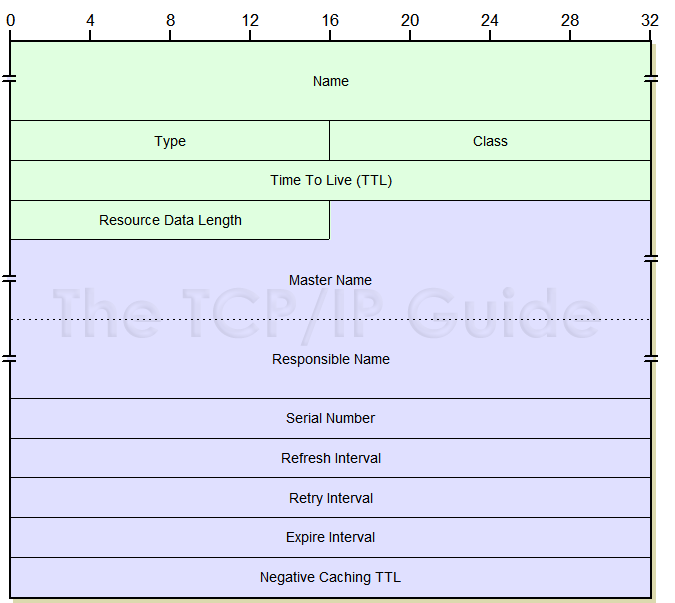 Negative Caching TTL: Originally carried the default Time To Live value for records where no explicit TTL value was specified. Now represents the zones negative cache TTL. See the topic on DNS name server caching.